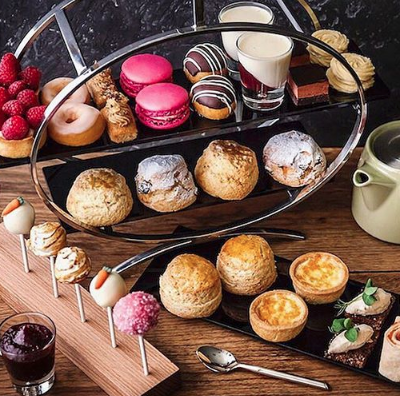 The Langham Hotel is renowned for its high class afternoon teas and you can't get much classier than a tea inspired by diamonds and pearls. 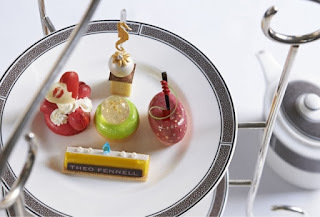 Designed by the Langham's in-house Pastry Chef Extraordinaire, Cherish Finden, in association with Theo Fennell, this tea will offer guests a taste of the high life, with fusions of eclectic flavours and fabulous colour schemes. Inspired by Fennell's exclusive Jewellery range, the decadent menu will include delights such as: Foie Gras and Smoked Duck with Mandarin, Beetroot Cured Scottish Salmon with Grey Goose Vodka Cream plus Pearl Las and Broccoli Quiche with Piquillo Peppers, Salted caramel Pearl and Pistachio Fudge and the Kentish Strawberry with White Balsamic Macaroon. 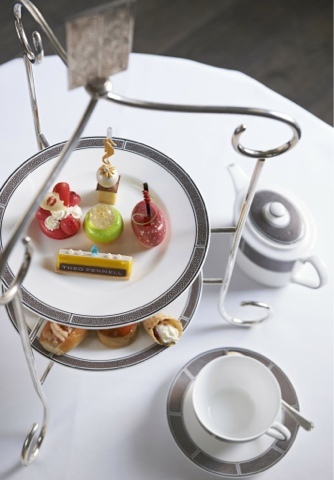 The Langham, London is delighted to announce its annual Bijoux Afternoon Tea collaboration with luxury jewellery designer Theo Fennell. The partnership celebrates Theo Fennell’s love of fine craftsmanship and eclectic design alongside The Langham’s illustrious past as Europe's first 'Grand Hotel' and the birthplace of the afternoon tea tradition over. Award-winning Head Pastry Chef Cherish Finden, recently voted ‘Pastry Chef of the Year’ at the Craft Guild Awards, has created a selection of irresistible treats, inspired by Theo Fennell’s exquisite jewellery collection. Served in the glittering Palm Court, the centre piece of The Langham, London since 1865, The Theo Fennell Bijoux Afternoon Tea is a modern day interpretation of the classic British tradition. Decadent savouries include Foie Gras and Smoked Duck with Mandarin, Beetroot Cured Scottish Salmon with Grey Goose Vodka Cream plus Pearl Las and Broccoli Quiche with Piquillo Peppers. Cherish’s inspiration for the pastries derive from Theo’s exuberant use of colour as well as his attention to detail. The Salted caramel Pearl and Pistachio Fudge is inspired by Theo’s intricately crafted 18ct Yellow Gold and Pearl Tropical collection, a handcrafted homage to our most beloved ocean dwellers. Cherish also celebrates Theo Fennell’s signature Art Pendants in her Kentish Strawberry with White Balsamic Macaroon. Other pastries include Victoria Plum with Sakura Sponge Mango and Passion with shortbread plus Royal Gala Apple with Champagne. We think it sounds fabulous and can't wait to try it for ourselves. Have you booked? Let us know what you think - we always love to hear your thoughts! The Theo Fennell Bijoux Afternoon Tea, priced at £49.00 pp, will be served at the Langham from 8th April until November 2013. For more information and how to book, please visit their website, HERE.